Every genre and medium of storytelling uses tropes, common themes or story devices. Tropes are so common in all types of stories that a whole website is dedicated to examining them all. Tropes often have a bad reputation—for good reason. All too frequently, they emphasize lazy storytelling or worldbuilding. If we hear about a YA book centered on the high school experience, we may immediately jump to conclusions about what the story will be about. For example, we might think: popular kids, bullying, standing up for yourself, etc. Most sports movies (and many “team”-focused movies in general) involve an underdog team of misfits who learn to value teamwork and themselves. As a result, they pull together better than an athletically superior team full of egotistical hotheads and go on to win the championship. Many tropes are narrower in scope, but can create just as many expectations about the story. For example, I can think of several stories involving an out-of-body trope, such as swapping bodies with another character of a different age or gender or waking up as themselves but at a different age. Even if we haven’t seen X or Y movie with that premise, we can all make a pretty good guess at some of the plot points in that type of story. We could probably also guess what the characters would learn about themselves and others. That’s partly what makes a trope a trope. Audiences can fill in the details of a trope without the story having to spell everything out. Are Tropes “Bad”? Or Lazy Storytelling? That shortcut aspect is what gives tropes a bad name. The lazy examples of those stories rely so much on trope formulas to carry the storytelling or worldbuilding details that the story itself fails to show rather than tell. In a lazy story with the high school trope, the popular kids would be cardboard characters with no development, the lack of support from adults in dealing with the issues would be over the top, and the final taking-a-stand triumphant speech would ring false. The audience would be told that the bullying would magically end because the speech was oh-so-inspirational, but they would have no reason other than the trope to believe that the case. Tropes are bad when we rely on them to carry the work of the story. Click To TweetIn a lazy story with the sports team trope, the misfit characters would be developed only as far as which stereotype they were each fulfilling, and the audience would never see that actual teamwork coming together (or not enough to feel real). The audience would instead be expected to believe that teamwork would automatically exist because…that’s what the misfit trope is all about. In other words, tropes are bad when we as storytellers rely on them to carry the work of the story. Just because everyone knows how the enemies-to-lovers trope in a romance story ends (hint: with the characters getting together in a relationship), that doesn’t mean the storyteller can skip out on doing the work to make the audience believe the characters have actually overcome their incompatible goals and found common ground. Yet for all those problems, story tropes aren’t “bad.” For many people, the tropes are why they like a story. Story tropes help readers know what kind of story we’re going to tell, what they can expect on our pages. Tropes fulfill that function in the same way that book covers often conform to genre clichés so readers know what to expect from the story inside. If we’re in the mood for a thriller, why might we choose one specific thriller story over another? It often comes down to the tropes—our expectations of the story. If we feel like reading about a protagonist using cutting-edge technology to trick a villain, we’re not going to choose a Civil-War-era political thriller. Why? Because we know a Civil-War-era story won’t meet our expectations for cutting-edge-technology plot points no matter how good of a thriller it is. We know the kind of story to expect when we go to the latest comic-book-hero origin-tale movie. If we went to the movie and the trope of an everyday character discovering their new superpowers didn’t play out at all, our expectations wouldn’t be met, and we might be disappointed. That’s not to say that we should completely follow the formula. *smile* The “similar but different” idea means that audiences want their expectations met—but in a surprising way. Audiences want their expectations met—but in a surprising way. Click To TweetWe can take the usual trope ideas and play with them. Twist them. Turn them on their head. The first Iron Man movie took the superhero origin story and twisted it by making the protagonist unworthy of his powers. Rather than being a relatable every-man, Tony Stark was an anti-hero. Audiences loved that similar-but-different idea for the superhero origin trope. They loved it so much that Iron Man‘s success established the beginnings of a powerhouse studio for Marvel. Tropes aren’t bad if we don’t take the shortcut idea too far, forgetting to actually develop the characters or the story. But can tropes actually be helpful? For many stories, we add depth by layering subplots or character traits, motivations, emotions, etc. We can also layer tropes. A trope doesn’t have to be the main premise of a story. A romance story could include a secret baby trope and an enemies-to-lovers trope and a fake engagement trope. Think of the most formulaic story you can. Chances are it relied on a single main trope. This one step of layering tropes might head off formulaic writing. Also as alluded to above, tropes can help us with marketing our story. Many “if you like X, you might also like Y” comparisons come down to finding similarities in the included tropes. Writers in the query process of traditional publishing might struggle to identify comparable titles for their query letter. We might find it easier to come up with comparables if we think of our story’s tropes and what other stories in our genre also use those tropes. We might use our story’s tropes to develop the back-of-the-book blurb. We can let potential readers know what to expect from our story by hinting in our book’s description at the various tropes we’ve included. Or, like on my Find a Book page, we might use tags to help match readers with their must-click favorite tropes. With a single click, readers can find the story elements they enjoy, or if they liked one of our books, they can find others with similar elements. As authors, we can analyze the tropes in the stories we’ve written and discover the types of tropes we gravitate toward. That might help us create our author tagline or describe our writing style. When going through those lists, I made a note of several tropes I think would be fun to try writing. So for the future, I now have a list of tropes to layer in and add to my usual story ideas. One of those tropes fit perfectly with the story I’m currently writing. I’ve been “blocked” on this story for a while, and the thought of how to layer in this trope gave me the ideas I needed to dig back into the draft. Yay! Do you have favorite story tropes (and if so, which ones)? Have you ever had story tropes in mind when deciding which books you might like? Can you think of other ways we can use story tropes to do good? Or do you disagree and think story tropes are always bad? 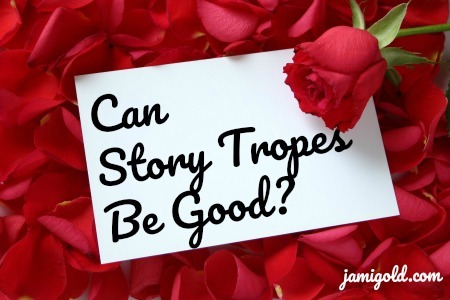 Can you think of other ways to avoid the problems that can come with story tropes? LOL! I love it! And great examples of how to include tropes but twist them around for a unique story! I just read a Romeo and Juliet in modern Texas. So there is always another outing for a popular theme. Another way tropes can help is that booksellers know where to put the book on the shelves. And the author knows how to market it. A reader in the market for the above romance is not likely to be scanning the non-fic or the horror shelves. On the other hand, the R&J trope can be the trigger for a murder, inserting the trope into the crime shelf. There’s always a way to make something fresh and different, and as you said tropes can help with shelving. Or if the genre and trope clash, that’s another way to twist things around. 🙂 Thanks for sharing! I don’t have a problem with tropes, if they’re done well or–this seems counterintuitive–if they’re done in an original way. I have a story idea that turns the whole “chosen child” thing on its head, for instance. I’m just finishing a novel that plays with all the space opera tropes, with a little wink as each goes by. But even if done seriously, they can still be done well. Exactly! Readers don’t mind tropes if they’re not too predictable, and if they’re done well, readers love them. 🙂 Thanks for stopping by!